Android P will turn your phone into a Bluetooth powered keyboard or mouse? 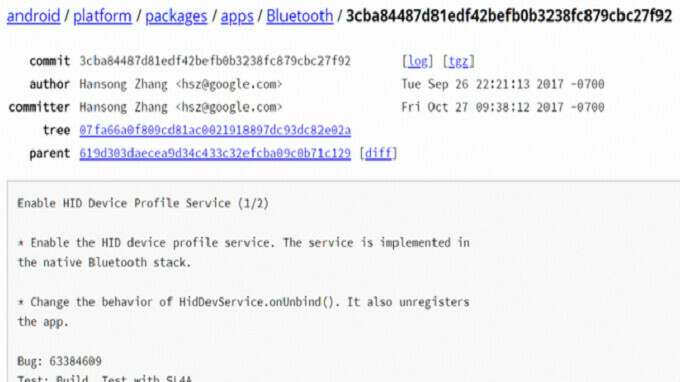 According to a report published on Monday, the next-generation Android P version of the open source OS will add support for the Bluetooth HID device profile service. This will allow your Android P powered handset to be used as a QWERTY keyboard or mouse using Bluetooth. The feature got its start back in 2014 when a member of Qualcomm’s CodeAurora forums submitted a patch for Bluetooth HID. The next step took place in December 2016 when the patch was added as a commit. Despite that, the feature was disabled on Android releases up through now; it will finally become enabled on Android P after a second commit was posted. The appropriate APIs are now unhidden for developers to use so that their apps will be able to work with the keyboard and mouse-like capabilities on phones running Android P.
The first phone line to have this feature up and running will no doubt be the Google Pixel and Google Pixel XL series. And while these new functions won't turn your phone into a PC, it will allow you to carry your computer without having to bring the keyboard or a mouse. Or not, considering the Achilles heel of Android (and we all know what that is). Android user, by the way. Well, we shall see if Oreo makes a difference then. System Updates after this point should come straight from the manufacturer. Cool feature! This would work well with Razer's project Linda. HaHa, Android P. Most Android devices may never receive O.